Should They Kill the Horses of Sable Island? The world's most deadly species wants to strike again. Sable Island is essentially a giant sand bank that rises above the gray waves of the North Atlantic, some 300 km (187 miles) off the shore from Halifax, Nova Scotia. It's 27 miles long, but only half a mile wide. It has only one resident and very few visitors, but is home to about 6,000 Ipswich sparrows, and is the host to the world's largest assembly of whelping gray seals. These seals give birth to tens of thousands of pups each winter, and are found lulling on the long beaches at other times. This lonely outpost is also home to a seasonal breeding colony of roseate terns, which are listed as a "species of least concern" worldwide, but the Canadian population is endangered under the federal Species at Risk Act. The island is home to a small resident population of harbor seals, and provides a rest stop haven for many migratory birds. It is famous for having fog an average of about 125 days per year and for being surrounded by dangerous waters that have led to 350 shipwrecks and counting. The highest point is about 28 meters (92 feet) above sea level. On November 2, 1991, the "Perfect Storm" scored a direct hit on the island, with the highest wave ever recorded for the region: 30 meters (98 feet). The island is ever changing in its shape, in response to the powerful forces of sea and wind. No one knows what will happen to Sable Island as global climate changes cause sea levels to rise and storms to increase in frequency. And then there are the horses: about 150 to maybe 400 of them. They have roamed the island for many generations, descended from animals deliberately put there in the 19th Century. An ever-so-romantic myth claims that they reached the island after escaping one or more shipwrecks. Either way, they are there because of human actions. The Ipswich sparrow, once considered a distinct species, is now regarded to be a subspecies of the widespread Savannah sparrow. There may be some insects who have achieved subspecies status as well, breeding there for such a long time in isolation from their mainland counterparts that the forces of evolution have slightly changed their appearance. More than 190 plant species have been found there. But, it is not a "pristine" environment. Sable Island has been impacted by humans for centuries. People have released cattle, horses, goats, and rabbits on the island, but most died off. This is a harsh place. The horses survived. Recently, Sable Island was added to Canada's National Parks System. You may think that's a good thing, but it's not necessarily so. Parks Canada, the agency in charge of National Parks, is committed to maintaining "ecological integrity," which is described as the environmental conditions that are "characteristic of its natural region and likely to persist, including abiotic components and the composition and abundance of native species and biological communities, rates of change and supporting processes." But, they don't mean it. Parks Canada staff just can't leave it all alone, arrogantly assuming that they know better what is good for nature than nature does itself. For years, they have shot nesting double-crested cormorants, a native species on Middle Island: a small, uninhabited island in southern Lake Erie that is now part of Point Pelee National Park. They also cull native deer, elk, and raccoons, and allow the hunting of the "invasive" moose in Gros Morne National Park, Newfoundland. The only thing that might save the gray seals is budgetary constraints. The government wants to kill the seals, but it seems unlikely that it will be willing to spend the amount of money it would take to do it properly (as outlined in a report on the proposed project a few years ago). To cull 100,000 to 120,000 seals per year, they'd have to build special incinerators, and all of the fuel, equipment, and supplies would have to be accommodated at a cost in the tens of millions, with no guarantee that it would lead to increased numbers of commercial fish stocks-and the possibility that it would have a counterproductive effect. However, the seals aren't safe yet. The fight to protect members of a species that is clearly part of this harsh environment may yet be under attack by the very agency mandated to protect it. And then, there are the fabled horses. 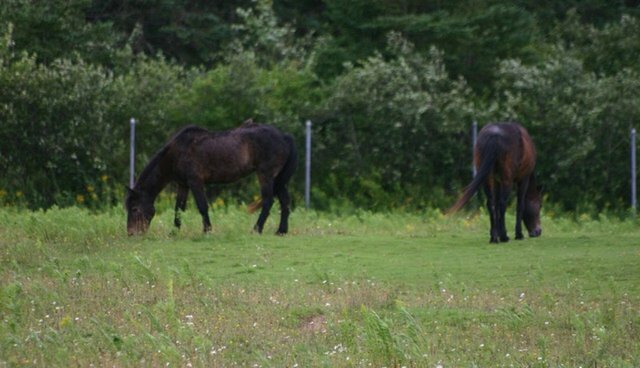 A biologist from Memorial University in Newfoundland and Labrador, who reportedly "specializes in the study of unique ecosystems" (I would argue that all ecosystems are unique), wants all of the horses removed. And, those of us who don't agree... Well, we are "not very well informed." This biologist is reflecting a view I once held myself: that humans are not part of nature, and that an animal species that is where it is as a result of human action does not belong. But, really, there is no part of the planet, from pole to pole and into the ocean depths, that has not been at least a little altered as a result of human action. Like it or not, we are part of the ecosphere-and, at the species level, an enormous part. Our role is hugely destructive. One of the things we managed to destroy was an evolving, distinct race of walrus that once lived on Sable Island. As Brenna McLeod and her Halifax colleagues put it, "Our data suggest that the Maritimes walrus was a morphologically and genetically distinctive group that was on a different evolutionary path from other walrus found in the north Atlantic." We sure put a stop to that! But, the horses of Sable Island are also "on a different evolutionary path" from all other horses. And, if they were to be left alone-assuming that Sable Island lasts long enough-they would become a form distinct from any other horse. Whichever agency is responsible for them being there-and that can only be human activity-did so a very long time ago. There is no indication that the horses are endangering anything. And, even if they were to clumsily step on every roseate tern nest there is, remember: world-wide, the species is regarded to be "of least concern" in terms of its conservation status. The horses of Sable Island will be unique as they evolve into an endemic form under harsh conditions that favor survival of those best equipped to live there. All species who live there, or anywhere, arrived at one time in their distant past history, raising the question: when do we agree that they belong? Government policies show a bias that reflects the ease by which we do so much killing. If a species is considered "game," like the pheasant or the brown trout, it is considered "naturalized"-but, if not, like the starling or the pigeon, it is considered "invasive" and does not belong. And so, we indulge in the two things we are so good at: determining the fate of the world's species, and killing. "Sable Island Horses" by Derek Hatfield is licensed under CC BY 2.0.